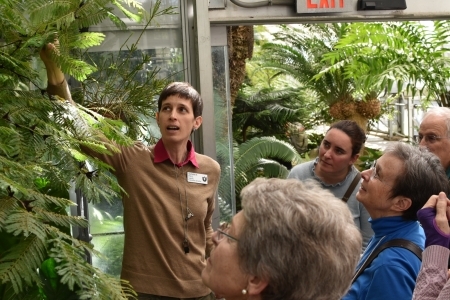 Education is core to the mission of the U.S. Botanic Garden. It is our vision for visitors to understand, wonder, experience, grow and connect to plants both within and outside our garden. We create opportunities to inspire our visitors to learn about the importance of plants and present a variety of educational programming. Led by experts in their fields, our programs and events offer something for every age, interest and skill level. With so many options to choose from each year, you will find something that suits your interest and teaches you more about the wonder of plants at the Garden! Teachers are welcome to bring students to visit the Garden for their own educational activities or to use one of the programs on our Field Trips page. No advance reservations are required. You may reach out to Lee Coykendall, Children's Education Specialist, as you plan your trip to the U.S. Botanic Garden. While at the Conservatory, enjoy our living classroom and explore a world of plants all year round! Looking for more educational opportunities and resources? From botanical art and illustration to sustainable gardening, you'll find additional education sources here.